My rating: 8/10. Good watch. Value for money, multifunction sports watch. Hello, today I’m doing a G-2900F-2VER review. 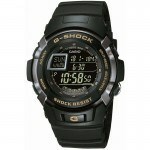 This is a great value for money Casio watch that’s perfect for those who want something a little different, yet still want to keep all the functionality you’d expect from a fantastic G-Shock watch. Let’s take a closer look at the details of this watch below. I hope you enjoy this G-Shock GA-110MB-1AER review below. This G-Shock watch has a standard colouration digital dial that packs in all the information from the many extra features that the timepiece includes. It’s a very easy to read dial with a backlight that makes the display easier to see in dim lit conditions. As you’d expect from a G-Shock watch the stainless steel casing is wrapped in this protective resin that gives the watch a great level of shock, vibration, heat, and water resistance. Protecting the dial of the watch we have a mineral crystal glass. This type of glass is specially hardened to make it extra resistant to scratches and knocks. It is also shatter resistant that’s ideal for a watch designed to withstand shock. Powering the watch we find a Japanese quartz movement. These are found in many Casio G-Shock watches and are known for their reliability as well as their low maintenance. 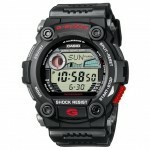 They are an accurate movement that’s also affordable making them perfect for these affordable Casio watches. As you’d expect from one of these watches, it’s fairly big, primarily due to that protective resin wrap. The casing diameter is 46mm whilst the thickness measures 15mm. This gives the watch a bit of a chunky feel and will certainly be noticeable on the wrist. Keep in mind that these larger watches aren’t so suitable for people with smaller wrists. The strap is also made of a comfortable rubber resin and has a 24mm width. This fastens with a fairly standard buckle style clasp. Being a G-Shock watch I’m sure you knew there were some extra functions to come. Features of this timepiece include a backlight, e-Data memory, world time display, alarm system, countdown timer, and a stopwatch. Band Resin strap, standard length, 24mm width, standard buckle style clasp. Case Stainless steel casing with resin surround, sizing diameter: 46mm and thickness: 15mm. 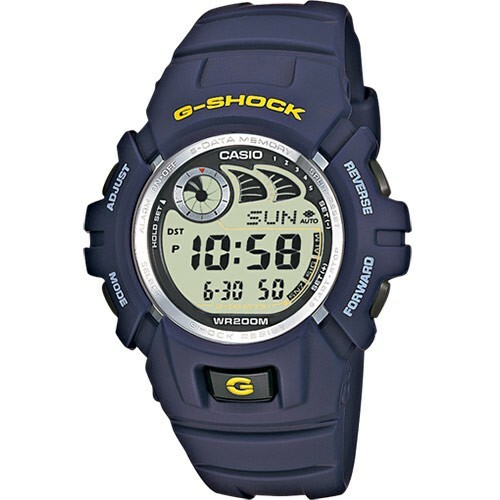 The G-Shock G-2900F-2VER with its brilliant blue design is a little different to many of the other G-Shock watches I’ve come across in this price range. It’s perfect for people with a more active lifestyle who are after a watch that can withstand a bit more of a battering. As always these watches offer great value for money and I highly recommend them. 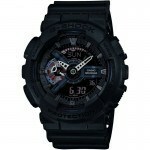 Hope you enjoyed this G-Shock G-2900F-2VER review. Find more watch reviews below.